Twelve hours ago I walked through the Arab American National Museum in Dearborn, my second visit there. Currently, the museum has an exhibit called What We Carried. To document their life-changing journey and shed light on the trials and tribulations refugees experience in their search for stability, renowned freelance photographer and author Jim Lommasson has created a project documenting what it means to leave everything behind. Lommasson invited Iraqi and Syrian refugees to share a personal item significant to their travels to America, such as a family snapshot, heirloom dish or childhood toy. Lommasson photographed each artifact and then returned a 13″ x 19″ archival print to the participant so the item could be contextualized by the owner. Exhibition visitors will receive firsthand insight into the consideration of what objects, images and memories might be chosen if one was forced to leave his home forever. The carried objects and the intense personal stories behind them combine in more than 85 images that illustrate the common threads that bind all of humanity: the love shared for family, friends and the places people call home. 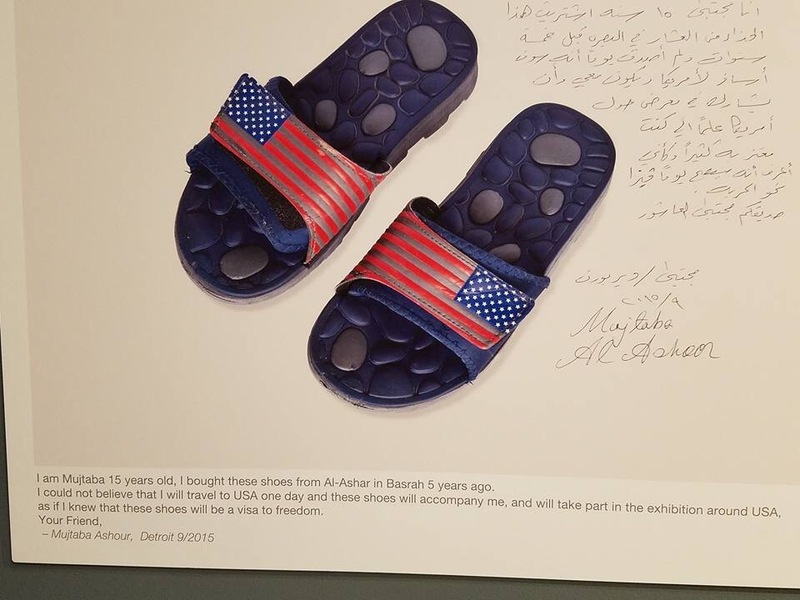 All of the pieces in this exhibition will be presented in both English and Arabic. The exhibit displays a total of 93 images. The three that are stuck in my mind include a pair of sandals from a 15-year-old who said he never believed they would become like a visa to freedom, a VHS tape of a wedding including images of a father “that would not be known,” and a quilt made of neckties from family relatives. I walked away from the museum with this thought-history is repeating itself. You learn in the museum that from 1880-1920 another huge migration happened, again because of families seeking refuge, seeking peace. We Americans are blessed. More deeply, believers in God are blessed. No matter where we live, no matter what the circumstances of life, we can have peace. My prayer is that all people of all nations would find peace in a relationship with God, their Creator, Redeemer, and Peace Giver.